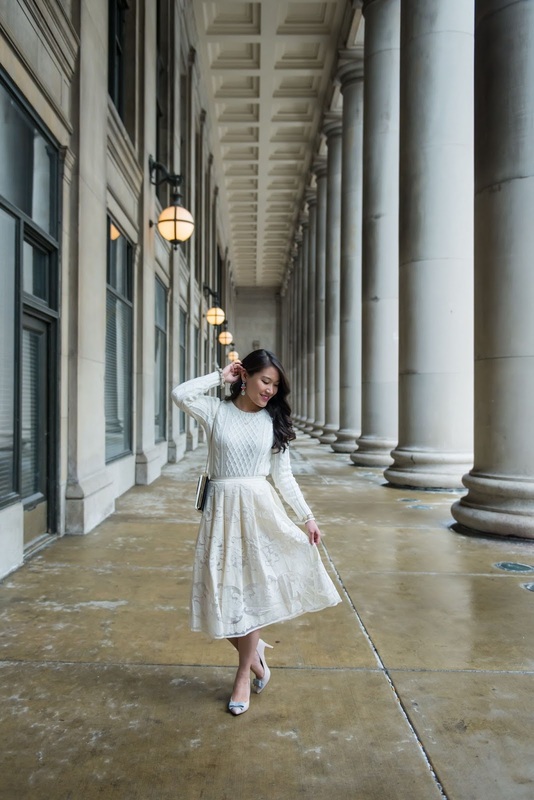 Dearest Chicago, I think Spring is nearing! I don't want to jinx it by saying it definitively, but with the snow & the icy lake melting, I'm excited to ditch my leggings & boots and trade them for bare legs & sandals! The transition between Winter and Spring is my absolute favorite. As I was thinking about it recently with this Lent season & the coming of Easter, I realized there was a deeper truth to that statement. As I shared in a previous post, winter's first real snowfall is always so magical. It's a reminder of a truth I hold dear that we, like the earth, can become white as snow. Despite my failures and mistakes, I have faith that Jesus died on the cross and rose again to wipe away all those marks against us and give us a fresh start. With that, there's hope for renewal. And with Spring comes the renewal! I love when the sun shines its glorious rays longer and that the light brings life to the earth. The grass grows green and the flowers bloom. All things on the earth, like our hearts, are made new & beautiful. This look is a perfect transition point between the two seasons. 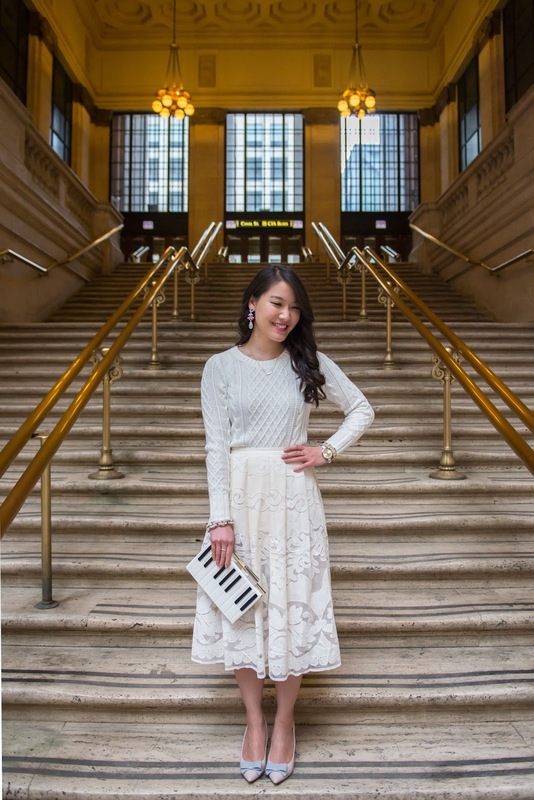 I paired winter whites with spring pastels. These colors are great together to remedy the awkward season transition phases since they really work in both seasons. 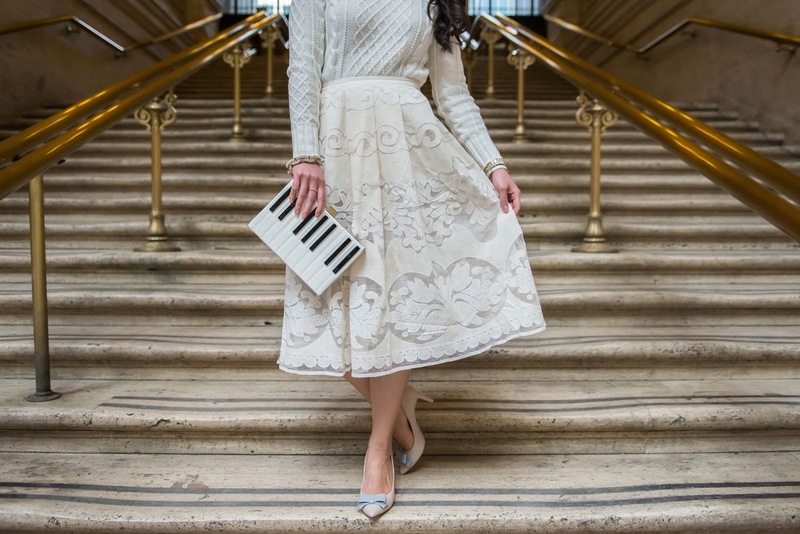 As per usual, I wanted to bring a bit of fun to this look with a piano clutch! It's so fitting with this past weekend I had since I played violin with my friend, Anu Alphonse, when he opened for grammy-nominated, Rhett Walker Band! Such an incredible night! i adore it! the skirt is beautiful and everything! head to toe! 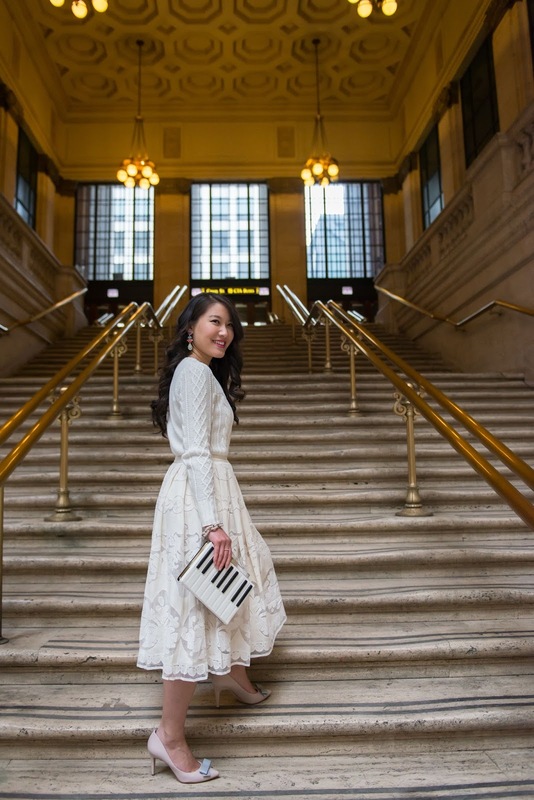 I just about dropped out of my chair when I saw this outfit -- it's positively stunning Joanna! You look incredible and so elegant and gorgeous! 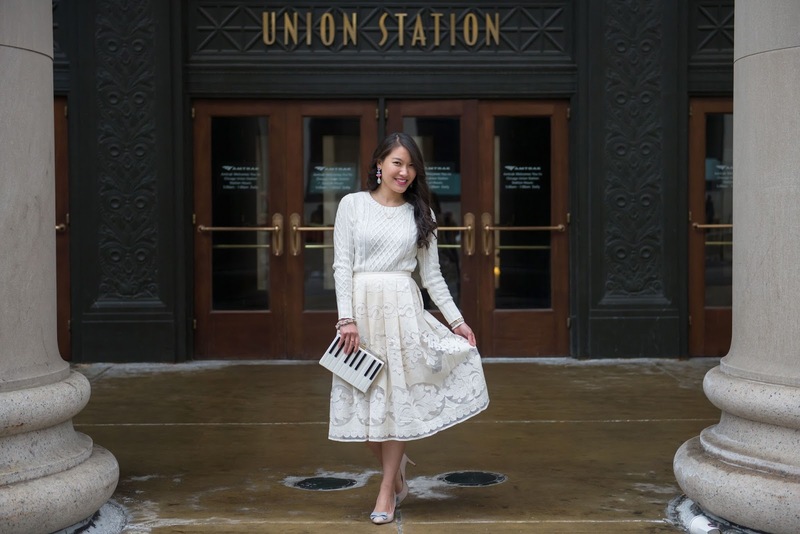 Not to mention Union Station is the perfect location for such a timeless ensemble! This is seriously the best outfit I've seen all day - the lights with just a brush of color are gorgeous! 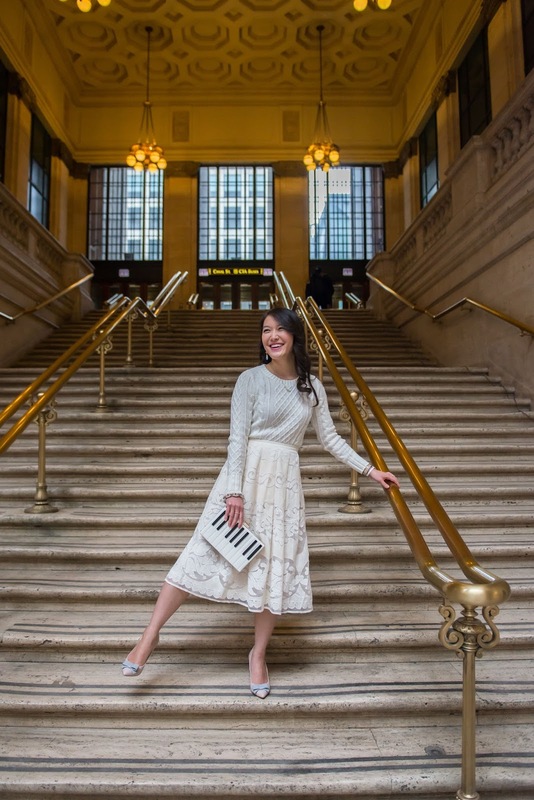 And that piano clutch just takes it to a whole new level. Thank you so much for the encouragement Madaline!! You look amazing. 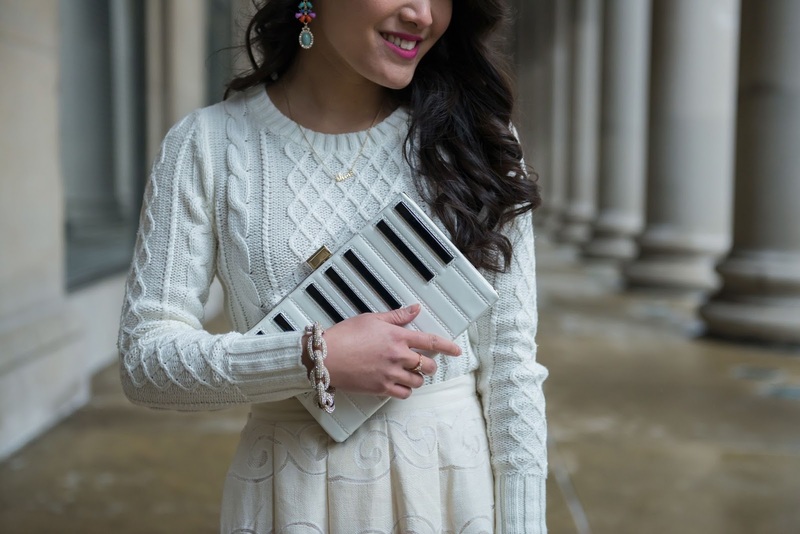 I love everything about this outfit and that clutch is gorgeous! Also, being brought up Catholic I agree with what you wrote in this post. Love it! And your shoes are so cute! This is so simple and perfect. 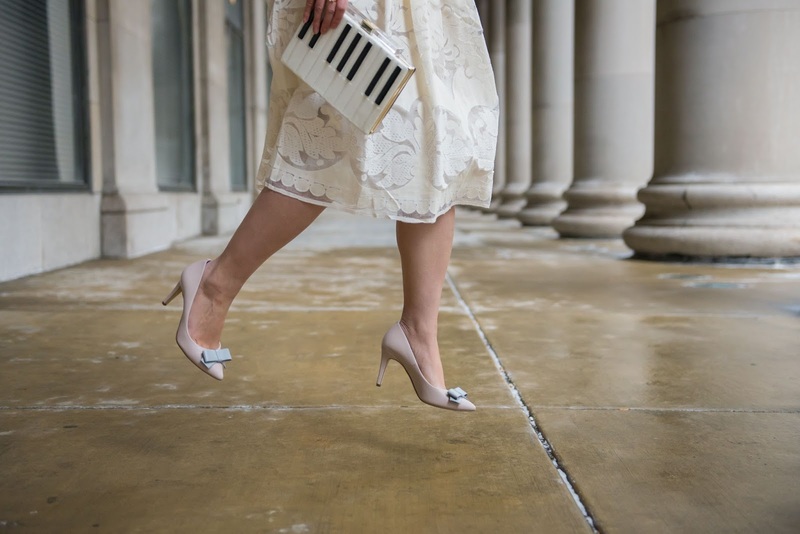 I love the different textures you played with, and those bow heels are adorable! You are so sweet! Thank you so much for the sweet words! I love this all white look! So delicate and feminine with a romantic vibe. This is such a perfect look! I am loving the warm weather we are having lately but am so worried winter is going to sneak back up on us... let's hope it doesn't haha! Yes, I'm definitely hoping Spring stays! :) Thanks so much! Beautiful outfit! I LOVE that purse! THAT PIANO CLUTCH. It is so quirky and fun for spring + summer! you look like a Snow White in your gorgeous ensemble! How perfectly gorgeous is this outfit? From that sweater to the skirt, and of course your uber pretty shoes!! Everything about this outfit is just stunning!! This is such a polished and stunning outfit! 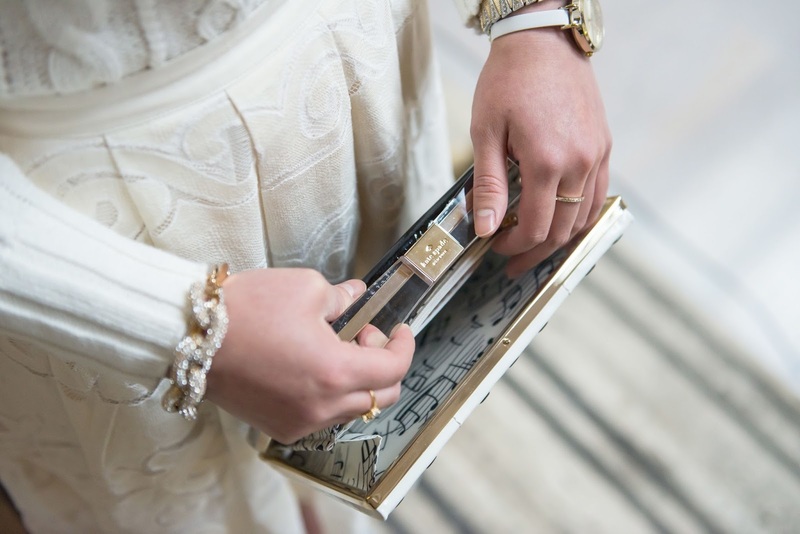 Lovely clutch!